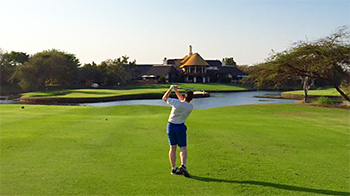 Leopard Creek Country Club is an exclusive facility, which opened in 1996. Businessman Johan Rupert owns it and his company sponsors the Alfred Dunhill Links Championship at St Andrews in Scotland. The front gate to the club is at the bridge leading over the Crocodile River into the Malelane Gate of the Kruger National Park. The entrance is as strictly secured as that at Augusta National, Leopard Creek being reserved for members and their guests. However, visitors can access the property, use the clubhouse, and play the course, by staying at various game lodges in the area, and paying a high-end green fee. The closest one to the course is Buhala Lodge, which is located a few kilometres away on the banks of the same Crocodile River which borders the golf course. Leopard Creek has been the annual host to the Alfred Dunhill Challenge on the European Tour since 2005. An addition to the golfing experience at Leopard Creek in 2016 was the construction of a par three course which replicates famous short holes around the world, plus a state-of-the art practice facility adjoining the par three course. Stuart McLean, editor of Golf Digest South Africa, informed us that Leopard Creek was closed for play at the end of 2017 because the course was undergoing eight months of major construction – including a total redesign of the par three 12th hole with its Redan green – and re-turfing, which resulted in the cancellation of the annual end of year Alfred Dunhill tournament. Many of the fairway bunkers have been repositioned and landing areas for handicap golfers widened. Kikuyu grass fairways were replaced with warm season Bermuda, a grass that requires 30% less water and fewer chemicals to maintain, and this move should help improve year-round playability and allow the golf ball to run further. Greens have also been planted with the latest strain of Champion bent grass from Houston, Texas, with Leopard Creek now having the South African rights to this particular grass. There is no doubt that Leopard Creek is a great course, with many memorable holes. However having paid full price (R4200 (£230), including having to stay at an expensive upmarket lodge for the chance to play the course) I was left VERY disappointed. The front 9 is much less memorable than the back 9. The course only really starts getting great when you reach the 9th, looking downhill at the clubhouse and the Kruger National Park in the distance. 11,12 and 13 is my favourite stretch of holes I have played. The par 4 11th is a wonderful hole, playing your tee shot into a fairway in a valley and back uphill to the green with your approach. The par 3 12th is a fantastic short hole tumbling downhill with the Kruger Park in the background. I took 2 clubs less and still over-clubbed - leaving for a very tough uphill chip with the green sloping to the front edge. Then comes one of the best holes in world golf. The par 5 13th will forever be etched in my mind. Bordering the majestic Crocodile River and overlooking the fantastic Kruger Park, while waiting for my birdie putt, I spotted Crocs and Hippos in the River with Elephants, Zebra and Impala strolling in the distance. Needless to say, I missed my birdie putt - its tough to regain concentration standing in one of the most beautiful spots in the world. I could have stayed on the 13th green all day, but needed to refocus and head to the next tee box. The view from the 15th tee is equally as breathtaking, with the champs tee being the highest point on the course. Assuming you play the course in proper conditions, every shot you play from the 9th tee to the 18th green will blow your mind. The par 5 18th is a truly fantastic risk-reward finishing hole - the long hitters will be tempted to go for glory with their 2nd shot to the island green. Welcoming you at the clubhouse will be an indulgent platter of biltong, droewors, ribs which wash down fantastically with a pint of cold beer. At its best, this course deserves an albatross rating. However, I am afraid that it was very frustrating, having gone out my way to play the course and being treated the way I was after having the cheek to request a discount given the condition of the course. Lets hope that this was a once off and the course doesn't rest on its laurels as it truly is one of the most memorable experiences of my life, despite having been left with a bad taste. Tagged as the number 1 course in the country, my expectations were very high. I had the benefit of playing the course twice at different times of the day so I got to experience varying playing conditions. The opening 8 holes at Leopard Creek are ‘average’ to say the least. I kept waiting for a hole to inspire me and stand out from the rest, but the opening stretch continued to offer straight-forward holes that didn’t stimulate the golfing juices. If it wasn’t for the wonderful par 3 5th hole over the water, the first 8 holes at Leopard Creek only piled up the questions I was asking. Standing on the 9th tee looking down towards the clubhouse began to offer some hope. The 9th and 18th green share a pond, giving the ‘island green’ affect which certainly grabs your attention and demands a perfectly struck (and judged) approach shop to avoid the need for swimming trunks. The rankings on paper are one thing, but nothing will ever beat playing the course for yourself and speaking with a lot of locals/natives. The back nine at Leopard Creek offers fabulous variety, challenge, risk, reward and even a downhill Redan par 3 with Kruger National Park as the jaw-dropping back drop. The 11th is a par 4 playing straight uphill with a tight tee-shot, the 12th is the Redan – however, the best hole on the property is the par 5 13th hole. I was massively impressed with every shot on this hole. The drive plays out to a diagonal plateau with water the whole way down the left-hand side until the green. The fairway narrows on the second shot leaving a daunting 80-100 yard pitch for the third shot on the green which is perched menacingly above the Crocodile River. 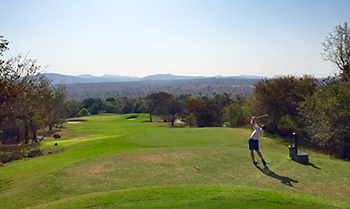 The magnificence of Kruger National Park marries beautifully with the iconic 13th hole. I also appreciated the “all or none” feeling you have standing the par 3 16th hole which asks for a 190 yard shot over water. Most photographs at Leopard Creek are of the glorious downhill par 5 18th which brings you back to that treacherous island green. The tension in your body really rises as you reach into your bag to pull a club. Of the 22 top courses I’ve played in South Africa, I’d rank this course closer to #7 in the nation. The difference in quality between the two nines is remarkable and definitely an influential factor when considering the overall rating. Leopard Creek Golf Club is a high light of any South Africa golfing holiday. It can be hard to get a tee time at this exclusive course but it is well worth the effort, it really does feel like 'millionaires golf'. Located in Malelane at the southern end of the Kruger it is ideal to combine with a few nights safari in the area.The course is in immaculate condition with every hole presenting a new challenge and amazing scenery. You will stop for a delicate array of sandwiches and scones at the halfway house which is included in your green fees.The signature hole which is the 9th onto an island green in front of the club house is a true risk-reward hole, lay up and play safe or go for the green and try to land your ball dead. The Best course in South Africa with a doubt!What makes this course unique is that not only are you playing a world class championship golf course, but you are sharing it with the wild animals of Africa. The par 3 16th is a 180 meter carry to a three quarter island green over a lake inhabited by Harry the hippo, amazing! When I played I had the pleasure of sharing fairways with giraffe and antelope,avoiding water hazards as they contained crocodiles, what a truly a African experience. The facilities at leopard creek at on par with the best in the world and golf course is a truly demanding test of ones golfing abilities the par 4's are long and the green are quick and undulating. If you are planning a golf trip to South Africa this course is not to be missed! Top Course in South Africa, rated currently above the Gary Player at Sun City. Unique location.